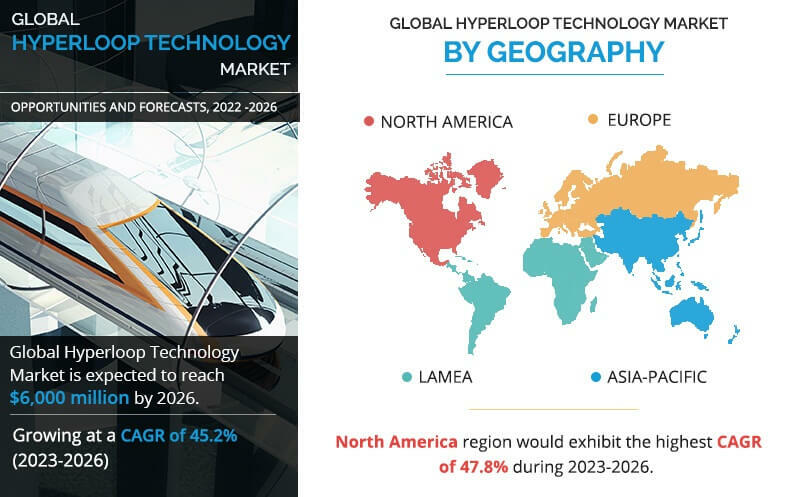 Global Hyperloop Technology Market is estimated to account for $1,350 million in 2022, and is projected to reach at $6,000 million by 2026, growing at a CAGR of 45.2% from 2023 to 2026. Hyperloop is a conceptual high-speed, intercity surface transportation system, which uses pod or capsule-like vehicle operating in a sealed vacuum tube with reduced pressure. Its average travelling speed is expected to be 600 mph with a maximum speed of 760 mph, which is faster than the alternative modes of transportation such as air, water, road, and rail. It comprises a sealed tube through which a pod or capsule travels free of air resistance or friction, conveying passenger and freight at high speed. Rise in demand for faster transportation mode has majorly driven the demand for hyperloop technology. Furthermore, low cost of the transportation technology as compared to other transportation modes and energy-efficient & environment-friendly nature fuel the growth of the market. However, the possibility of technical glitches and shortage of power act as the considerable restraints of the market. Conversely, decongestion of traffic is anticipated to provide potential opportunities for market expansion. AECOM, Dinclix Ground Works, Hyperloop India, Hyperloop One, Inc., Hyperloop Transportation Technology, Space Exploration Technologies Crop., Tesla, Inc., TransPod Inc., Uwashington Hyperloop, and VicHyper are some of the key players operating in the global hyperloop technology market. The hyperloop technology market is segmented based on carriage type, transportation system, and geography. On the basis of carriage type, the market is categorized into passenger and cargo/freight. The transportation systems considered in the study include tubes, propulsion, capsule, and route. Geographically, the market is analyzed across North America, Europe, Asia-Pacific, and LAMEA. The hyperloop technology is a pod-like vehicle, which operates through a reduced pressure tube that reaches average speeds of more than 350 miles per hour. For instance, the time taken by the travelers to travel from Los Angle to San Francisco and vice versa is just 35 minutes for a distance of 347 miles. Conversely, the bullet train runs at a speed of 150 miles per hour, taking people from Los Angles to Las Vegas in 80 minutes for a distance of 229 miles. Moreover, the distance between San Francisco and Los Angle is six to eight hours, depending on traffic, but the hyperloop transportation technology cuts that commute to just 30 minutes. Hence, high speed of this technology as compared to other transportation modes is significantly driving the growth of the global market. Owing to rise in concerns of environment degradation and depletion of natural resources, various technologies are being launched in the market that support the eco-friendly concept. Moreover, increase in awareness towards the consequences of air pollution caused by the conventional transportation modes and rise in level of exposure to traffic & noise drive the adoption of hyperloop technology. Hyperloop technology has transformed the travelling experience, as it is the fastest mode of transportation. Furthermore, the benefits such as minimum cost, high speed, environment-friendly nature, and energy-efficient approaches are attracting investors towards it. However, safety & security concerns of passengers are expected to hinder the market growth. For instance, single breach in hyperloop can cause major damage, as air would rush into the tube at about the speed of sound. This study comprises analytical depiction of the global hyperloop technology market with current trends and future estimations to portray the imminent investment pockets. The current market is quantitatively analyzed from 2022 to 2026 to highlight the financial competency of the market. 7.6. SPACE EXPLORATION TECHNOLOGIES CORP.
Hyperloop is a conceptual high-speed transportation system, the route of which was initially proposed from Los Angeles to San Francisco. This technology operates as a pod-like vehicle through a reduced-pressure tube, which potentially exceeds airliner speeds. The average travelling speed is expected to be 600 mph with a maximum speed of 760 mph. Passenger and freight are loaded into the hyperloop, and accelerate gradually through electric propulsion via a low-pressure tube. The tubes are made out of thick, strong steel and can handle 100 Pa of pressure or even more. By transportation system, the market is segmented into tube, propulsion, capsule, and route. Based on carriage type, it is classified into passenger and cargo/freight. By carriage type, passenger segment is expected to be the dominant segment in 2022, and will continue its dominance during the forecast period. By transportation system, route segment is anticipated to witness the highest growth rate during forecast period, followed by tube. AECOM, Dinclix Ground Works, Hyperloop India, Hyperloop One, Inc., Hyperloop Transportation Technology, Space Exploration Technologies Crop., Tesla, Inc., TransPod Inc., Uwashington Hyperloop, and VicHyper are key market players operating in the hyperloop technology market.